This weekend I felt homesick. It has been more than three years since I have been to India to see my family – my parents, sister and relatives. The weather is starting to cool down with rains already on the way in Seattle. It brought back memories of the monsoons in India. When it rains there, it pours, literally. The streets would be flooded with water to the point where everything would close down. We would watch the rains from our classroom windows hoping they would close the school early and let us go home. As kids, we loved the rain. There was just a different feel to the environment around us. We would run around in the rain and make paper boats and let them float in the water puddles on the ground. Once the school was over, my sister and I would take the rickshaw home. Even though we had a raincoat and umbrella, we would still get wet since the rickshaw would be shared by 5 other kids. When we got home, I could smell the aroma of the food my mom was making for us. She would make us spicy dal (lentil) with dhokli (dumplings) in it. We would devour the food and would instantly warm us. Nothing like eating this recipe on a cold, rainy and bleak day. Don’t feel overwhelmed with the length of the recipe. It is an easy dish. You can make it in two steps if you like – make the dumpling pieces and freeze them in a cookie sheet. 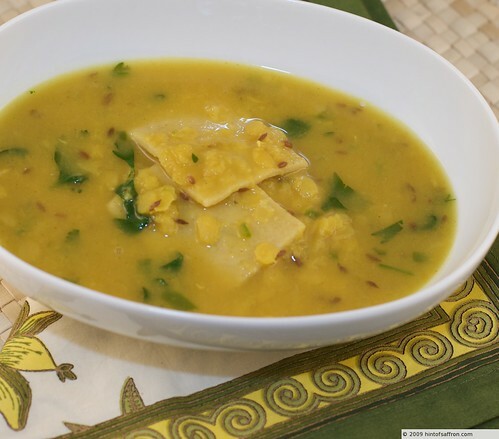 When you are ready to make the recipe, you just have to make the dal and add the dumpling pieces to the dal. You will really enjoy the final result. It makes for a very comforting meal. 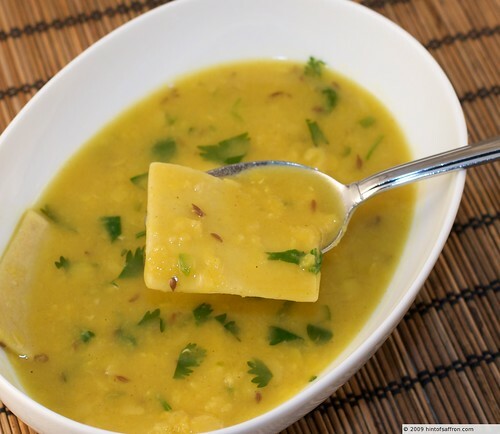 In a 1-quart saucepan, bring the water and toovar dal to a boil on medium-high heat. Skim off any foam that forms on the surface. Lower the heat to medium and simmer for 25-30 minutes. 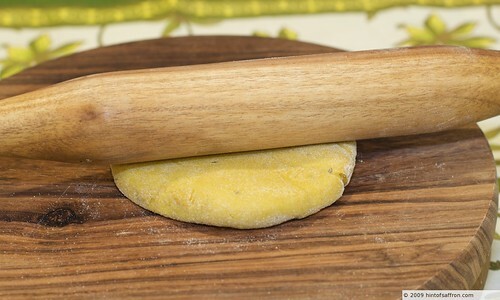 While the dal is cooking, make the dough as outlined in step 1 under the dumpling section below. Add the turmeric to the dal and transfer the dal to a bowl. Rinse the saucepan. After the dal is cooked, heat ghee in the saucepan on medium-high heat. Lower the heat to medium and add the mustard seeds. Make sure to have a screen or a lid handy. Once the popping subsides, add the cumin seeds. Add the chopped green chili. Stir fry for about 20 seconds and then add the coriander and red chili powder. Stir fry for 20 seconds and then add the dal. You should hear a sizzling sound (called bagaar or chownk in Hindi) as soon as you add the dal. If you don’t, it means the heat was not high enough. Either way, you should be okay. Add the salt. Lower the heat. Make the dumplings as shown below. * Coriander Powder – Make sure to get the Coriander powder from an Indian store or from here – Shop for Indian Grocery Items. I have tried the powder from regular stores and it tastes very different from the ones used in Indian cooking. Combine all the ingredients (except water) and mix well. Slowly add water and make it into a stiff and smooth dough. Cover the dough with a plastic wrap and let is stand for 10 minutes or so. 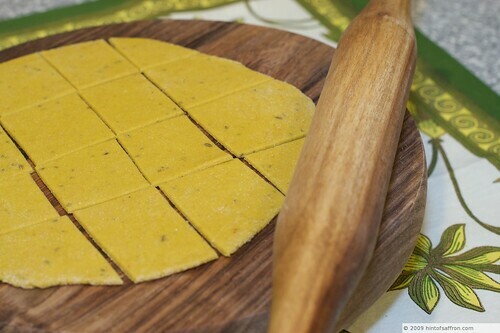 Divide the dough into 4-5 pieces and roll each piece into a circular or rectangular shape. Using a pizza cutter or a knife, divide into 2 inch pieces as shown. Add one by one to the dal. Make sure not to crowd them or they will stick together. As you add each rolled out dough, stir the dal and dough. NOTE: You can also freeze the dhokli pieces separately if you like to have it handy the next time you make the recipes. Just double the recipe for the dhokli and freeze half of it. Cook the dal and the dhokli pieces for 10 minutes or so. Make sure that the pieces are cooked by tasting one of the pieces. Add the lemon juice and the chopped cilantro and stir. Add a little ghee when you serve and eat!